A new recipe to lose stubborn fat is revealed by the researchers working at Baylor College of Medicine. This “lose stubborn fat” recipe is so easy, you’ll be shocked how powerful it is — according to the Woman’s World magazine. First ingredient? A simple, sensible diet. Next up? Low sodium vegetable juice. Mix the 2 together and — presto! — you’re set to melt 300% more fat than if you used the sensible diet alone. The Baylor dieters all had metabolic syndrome, a cluster of risk factors—including high blood sugar and cholesterol — that make fat extra stubborn. Yet juice drinkers still lost big — stubborn fat! 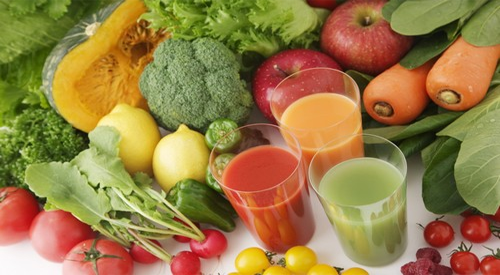 The Woman’s World magazine asked a group of readers to try “juicing off” weight, they dropped up to 7 pounds in 7 days! Everybody in the Baylor study was put on the DASH (Dietary Approaches to Stop Hypertension) diet, a well-balanced plan designed by the National Institutes of Health to keep Americans healthy. Some were also asked to drink 1 – 2 cups of low sodium V8 a day—and these folks ultimately shed the most weight. At DASHDiet.org you can learn to make your own DASH meals. Following a DASH diet plan has been found to lower blood pressure naturally and reduce cholestrerol by 14 points in 8 weeks! A cup of vegetable juice has 50 calories. Jonny Bowden, Ph.D., author of The 150 Healthiest Foods on Earth, says, “The juice takes up a lot of space for few calories, which tricks your body into feeling satisfied with less.” A Penn State study found that drinking vegetable juice before a meal automatically makes us eat 136 fewer calories. In the Baylor study, juice drinkers got double the vitamin C of other dieters. Arizona State University (ASU) tests show that Vitamin C enables our bodies to produce an amino acid crucial to fat burning. ASU scientists have proven that folks who skimp on C burn 11% less fat, while those who up their C intake burn 30% burn. In addition to Vitamin C, “a single serving of vegetable juice is packed with literally thousands of different vitamins, minerals, antioxidants, and anti-inflammatory compounds. . . This new study certainly seems to prove that they can help with weight loss,” says Bowden. The Woman’s World readers who tried this lose stubborn fat recipe had followed the DASH Diet guidelines. Woman’s World Hint: Opt for store-brand juice, and you can supercharge your weight loss for just $3 a week! “I lost 5.5 pounds and 9.5 inches in a week. For weeks before that, I had been dieting and barely losing. This worked really well and right away! —Rachel Bausch, Los Angeles model. Rachel lost 3.5 pounds in one week. —Sharon Goen, 56, Brownfield, Texas; lost 7 lbs. in 7 days.